OXFORD, Miss. – Few people have had more impact on America’s culture and political landscape than civil rights leader Dr. Martin Luther King Jr.
Over the next week, the University of Mississippi School of Law will host several events to commemorate King’s life, legacy and fight for civil rights and examine how we can move forward in today’s society. “The law school is honored and excited to organize the university’s annual Dr. Martin Luther King Jr. commemoration,” said Michèle Alexandre, associate dean and professor of law. “This year, we are especially delighted to have the participation of renowned scholars and leaders like Dr. Ethel Young Scurlock, award-winning writer Kiese Laymon and our dynamic student leaders. On Wednesday (Jan. 30), the Black Law Students Association hosts Jody Owens II, executive director of Mississippi’s Southern Poverty Law Center, as keynote speaker for the Dr. Martin Luther King Jr. Luncheon. Owens dedicates his service to reforming the state’s juvenile justice system and represents the state’s most vulnerable children. His work also includes seeking reform in the state’s criminal justice, educational and mental health systems. The law school will host a two-part viewing Wednesday and Thursday (Jan. 30-31) of the HBO documentary “King in the Wilderness.” The documentary focuses on King’s life in the 18 months leading up to his assassination, including behind-the-scenes footage of King as well as archival photos and conversations, providing a glimpse into the triumphs and challenges of King’s mission. Part 1 of the documentary will be shown at 5:15 p.m. Wednesday, with Part 2 slated for 12:45 p.m. Thursday. A discussion will follow the second hour of the documentary. The screenings are open to the public, and pizza and refreshments will be served. The School of Law begins its observance of Black History Month on Monday (Feb. 4) with a Dr. Martin Luther King Jr. Commemoration Panel. Student leaders will discuss King’s legacy and coalition building to follow in King’s footsteps. Sammy Brown and Conisha Hackett of the Student Bar Association, Laura Cooper of BLSA, KyMara Guidry of OUTLaw, Rosa Leon of the Latino/a Law Students’ Association and Emily Lovelass of the Law Association for Women, all student leaders in the law school, are set to participate. They will be joined by Ethel Young Scurlock, interim director of the university’s African American studies program and associate professor of English and African American studies. “It important for us to remember that Dr. King was more than a dreamer; he was a political activist, a public intellectual and a minister who worked to empower communities across the nation,” Scurlock said. “He challenged unjust laws and pushed Americans to take a critical look at U.S. policies and prejudicial practices. The panel discussion, set for 12:30 p.m. in Weems Auditorium at the Robert C. Khayat Law Center, is open to the public. 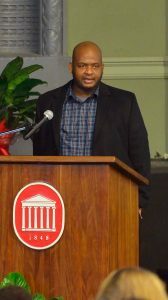 On Feb. 6, Kiese Laymon will speak to students on the legacy and future of the civil rights movement. Laymon is the UM Ottilie Schillig Professor of English and Creative Writing. Last year, he released his new book “Heavy: An American Memoir” which details his experiences as a black man growing up in Jackson through essays and personal stories. “Heavy” was named to a New York Times best book of 2018. A reception and book signing will follow the lecture. Dr. Martin Luther King Jr. Luncheon – 12:15-1:30 p.m., Robert C. Khayat Law Center, Room 3001B. BLSA presents SPLC Executive Director Jody Owens II as keynote speaker. “King in the Wilderness” Documentary (Part 1) – 5:15-6:30 p.m., RCK Law Center, Weems Auditorium. The law school hosts the first hour of the documentary. Refreshments will be served. “King in the Wilderness” Documentary (Part 2) and discussion – 12:45-2 p.m., RCK Law Center, Weems Auditorium. The conclusion of the documentary will be followed by an open discussion. Pizza and refreshments will be served. Dr. Martin Luther King Jr. Commemoration Panel – 12:30 p.m., Weems Auditorium. A panel of law student leaders led by Ethel Young Scurlock will discuss King’s legacy and coalition building. School of Law Presents Kiese Laymon – 5:30-8 p.m., Weems Auditorium. Laymon will speak with students on the legacy and future of the civil rights movement, followed by a book signing and reception.